SkidStorm is a multiplayer racing title from Cheetah Mobile, that offers a more minimalist take on an increasingly popular mobile gaming genre. With simple graphics, simple physics, and simple in-game mechanics, there are few bells and whistles in this new title, but you still get 17 cars to unlock, all of which have their own individual stats, strengths and weaknesses, and 24 tracks that can also be unlocked as you progress further in single-player career mode. 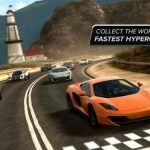 Playing the game is very easy, as we’ll explain in a bit, but the question is this — can you unlock all the tracks and cars, and dominate your opponents as you drift from corner to corner, from track to track? Of course, that’s where guides such as this one will come in, as we’d like to offer some help if you’re a new or intermediate player who wants to win more races and unlock more stuff. So with that said, here’s our SkidStorm strategy guide for new and intermediate players, though if you’ve been playing the game longer than most, you might find a tip or two in here which you can use to your advantage! Controls in SkidStorm are just as simple as the game’s graphics. There’s no need to get off to a perfect start, no need to shift from one gear to the next, heck, you don’t even have to hit on the gas or the brakes. All you have to do in this game is turn left, turn right, and activate your nitro. That’s all there is to it, as the game automatically handles all the dirty work for you, leaving you to drift from left to right to negotiate the various courses, and build up your nitrous boost. This game, as compared to other racing titles, is all about simplicity, so just remember these few simple commands: tap the left arrow to turn left, tap the right arrow to turn right, tap on either one of the “N” icons to activate the nitro and get a short burst of speed. And when it comes to the races, both single-player career and multiplayer modes pit you against three opponents, so that’s four cars fighting it out in three-lap races, with the third lap usually the time when AI opponents turn up the heat! Regardless of the course you’re competing in, or the game mode, you’ll notice that some parts of the track have darker lines that look like tire streaks from the cars that had just drifted past there. You should try to position your car in such a way that it passes through those streaks, as that’s the ideal path your car should be taking to give you some additional speed and an extra edge over your opponents. Of course, it wouldn’t be too ideal if there’s another car already driving over the streaks, and we’ll explain in a bit why it’s not always a good idea to rub against, or bump your opponents’ vehicles while racing. 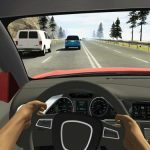 Some racing games actually reward players for employing physical driving styles, where they rub against, or even bump off their opponents’ vehicles to get an extra advantage. While there’s no damage mechanic in this game, which, we would say, is a good thing as it keeps things simple, the physics in SkidStorm aren’t really that sophisticated, which means you could end up with more than you bargained for if you come into contact with another vehicle, may it be intentional or accidental. Far too often we’ve seen our cars spin out of control after coming in contact with a faster car, with that faster car still on the track and pulling away from us. 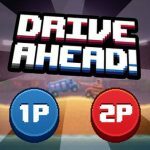 It’s better to drive quickly, yet safely in this game; while this takes practice, it’s your best bet if you want to win more races, get more coins and gems, and unlock more tracks. When it comes to using your nitro in SkidStorm, the best place to do this would be when the coast is clear — no obstacles to bump into, no cars in front to potentially block your path (unless you’re fighting your way from behind), no tight turns to throw you off your guard. As such, you’re best off using nitro when in the straights, and as we mentioned earlier, you can fill up your nitro meter simply by drifting. As long as the nitro buttons are white, use it when the occasion calls for it and give yourself a comfortable lead…or a better chance to beat out your opponents! We’re seeing this as something that’s becoming more prevalent than ever in the world of mobile games — less chances to farm for currency by replaying levels that you’ve already completed. In SkidStorm, the prizes you win are of the one-time variety, though even if you’ve already three-starred a racetrack, you can still return to that track and replay the same race, this time with the goal of earning Crowns. These are bonus milestones which you can reach by posting a winning time considerably faster than the rest of the AI pack in career mode; while you can actually see AI cars in solid form, the milestone times will be represented by ghost cars, with one, two, or three crowns above them. If you beat the one-, two-, then three-crown challenges in order, you can win up to 15 extra gems per track, which might not be much, but could add up if you frequently return to a track you’ve three-starred with a new and/or upgraded car! Of course, you need to make sure your car is competitive at all times, and you can do that by going to the Garage and upgrading your car’s five parts — the Engine, the Turbo, the Drivetrain, the Nitro, and the Off-road parts — by spending some coins. And you’ll want to prioritize your upgrades based on the stats where your car needs the most work on. Engine upgrades are the most expensive across the board, but if you’ve got a particularly slow car, which would be the case with most of your early vehicles these are the ones you want to focus on. Drivetrain upgrades could help a car that’s weak in handling, while Turbo upgrades improve your car’s acceleration. Nitro upgrades are self-explanatory — they allow your nitro to last longer and have more of an effect on your car. Lastly, Off-road improves your car’s ability to drive in off-road situations, or get out of the turf/ice/other terrain and back to the asphalt. You can customize your car’s upgrades to your liking, though ideally, your goal should be to balance its stats out to the best of your capability. 8. To Move On To A New Car Or Not To? Currently, there are 17 vehicles you can unlock in SkidStorm, all fictional, but all meant to represent certain car types. For example, your starter car, the Cruiser, is a basic two-door sedan, the Comet is a basic hatchback, the Renegade a basic coupe, and the Chieftain a pickup truck. You can unlock new cars when you unlock the first part by opening the boxes/crates you win in the races, and each time you see a car pop up when claiming your rewards, that represents a new part; collect all five and the car is officially unlocked. You can also spend gems to buy any one of the missing parts, though we wouldn’t really recommend spending a premium amount of gems just to unlock a new car faster. That said, the smartest way to go about the common dilemma of sticking to a new car or unlocking a new one and using it is to upgrade your current car as far as you can go until a new one is unlocked, then move on to the new car and work on upgrading it next. Rinse and repeat, until you’ve unlocked all of the cars. Each car has its own strengths and weaknesses, so it wouldn’t hurt to collect as many of them as you can, then upgrade them so that they can match up well with AI, or especially human opposition. Want to hone your racing skills without having to worry about any kind of stakes? There are two ways to do this in single player mode — Time Trial and Single Race. For Time Trial mode, you’re given a certain amount of time to complete the track of your choice, and you technically do not have any AI opponents here. You will, however, be racing against a single ghost car representing a previous, random human player’s efforts, and that should give you an idea where you stand against the rest of the world; if you can beat the ghost’s time, then you’re on the right track. Single Races are like the career mode races, as you’re competing against three AI bots. The only difference is that you’re not racing for stars or crowns; as we said earlier, there aren’t any stakes involved, so you don’t need to worry about getting beat out in the final lap or not beating the ghost cars so you can get some crowns. It’s simply a way for you to practice without pressure. 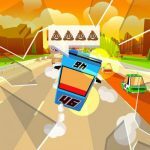 Although the straights, short as they are in most tracks, may seem like easy street for those who are used to more conventional driving games, that’s where you should be taking the most care in a game like SkidStorm that focuses on drifting. It’s very common to lose control while on the straights (the one place where drivers very rarely lose control in more conventional races) if you hit the left or right button too much or for a split-second too long. Take care when trying to steady your car in the straights; go overboard with the directional buttons and you might end up careening into an obstacle and stalling for a precious second too many! Fortunately, the folks behind SkidStorm have a lot of videos to serve up, and a lot of prompts to ask you if you want to watch videos. May it be to open a crate without using one of your keys (which take about an hour and a half per key to refresh), to open one of the bonus prizes, or to earn a few free gems, you won’t be lacking in opportunities to watch ad videos. They take just 30 seconds to complete, so make sure you’re playing the game with your internet turned on, and take advantage of the benefits provided by these ads! SkidStorm comes with a Daily Challenge, which sends you to a random track, with a random car for you to try out against an AI opponent that’s driving the same car. If you’re just starting out, this is your chance to try out cars you have yet to unlock, but more importantly, winning the Daily Challenge (which you can repeat as often as needed within a 24-hour time span, until you beat it) earns you even more rewards — once again, this means more coins, gems, and/or car parts, so don’t pass up this game mode! The AI opponents are fairly easy to defeat anyway, as we’ve observed. The multiplayer races become available once you reach level 2, and at that point, you probably won’t have much of a car yet. You’ll most likely still be using your starter car with a few upgrades, and you might see your share of third and fourth-place finishes. But as you keep upgrading your existing cars and unlocking better ones, you’ll find yourself having an easier time winning, or finishing second place in the races, and winning the better crates, which could get you more rewards, and better/rarer ones too. Just take note that as you earn more points in multiplayer mode, you’ll progress through the leagues faster, which means you’ll need to make sure your cars are properly upgraded to increase your chances of being competitive in the next league! 14. Should You Bother With The Clan Feature? Clans become available at level 4, and as we’ve noticed so far, this social feature isn’t exactly the hottest one out there just yet. Maybe it’s because this is a fairly new game, but as we’ve seen, almost all the clans out there have only one or two members. This was obviously meant as a feature where you can trade tips and tricks (as well as in-game resources) with your fellow clan members, and compete for clan supremacy, but for the meantime, we suggest passing on this option unless you can find an active clan that has at least 6-8 members out of the maximum 20.